Reds’ Away Days up North – Craig Bratt. Regular CTSA traveler, Craig Bratt gives us the lowdown on the trips to Rochdale and Fleetwood. On 17th January, Reds took their first ever trip to Spotland, Rochdale. It was a frosty, early start aboard the CTSA coach as it headed up the M23 at 6.30am. With an initial quiet journey, news soon broke of impending snow in Rochdale, leaving many wondering if it was to be a wasted journey. Nevertheless, the usual coach entertainment made the journey more enjoyable. With the pitch at Spotland passing its initial pitch inspection as the CTSA coach pulled of Warwick services, the 40 or so weary travellers breathed a huge sigh of relief. This wasn’t the end though… As the coach headed towards Rochdale on the M56, news from the ground was that the snow was getting heavier and there was to be another pitch inspection. 12.30 saw the pitch pass its inspection again and as we pulled into the ground, a few snowballs were thrown (mostly by me!). Most of the supporters headed to the bar adjoining Spotland’s main stand where we were made welcome by a number of home supporters. It was here we were joined by Bolton fan Lee, who also came along to Oldham in November, with his friend Jake arriving later on. After soaking up the pre-match atmosphere, we headed into the large away stand running the length of the pitch. Spotland is a fairly tidy ground. Opposite the away support was a smaller single tiered stand, with supporting pillars, that housed the directors seating and dug outs as well as the tunnel. Behind one goal is an all seated stand, opposed by a smaller terraced stand, similar to our very own Bruce Winfield Terrace, where the more vociferous home support congregated. Snow was still visible on what looked to be an absolutely pristine playing surface, meaning the game was to be played in tough conditions. The result may not have been the best, but Marv’s goal did give us a little bit of joy with ten minutes to go and all credit should go out to all the volunteers who helped clear the pitch to make sure our journey was not wasted. The journey back was subdued, but nonetheless made more enjoyable by a few Crystal Palace fans at the services. Anyone on the coach that day will get the reference! 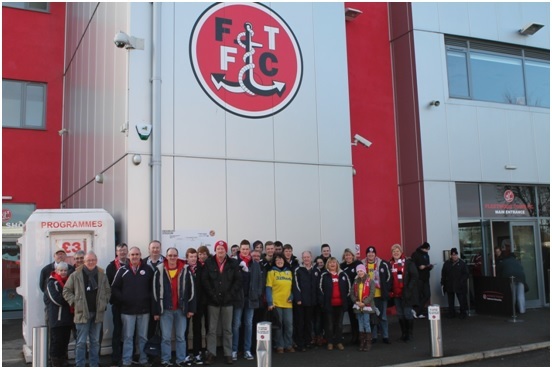 Another trip up north just a week later saw the Reds travel to former non-league opponents Fleetwood Town. It was déjà vu for the CTSA with another 6.30am start from the stadium, but at least there was no doubt about the game going ahead this week. The first part of the journey was fairly quiet, but there was a breakfast stop at Warwick services where coffees were drunk and full English’s were consumed, before part two of the trek to the Fylde coast began. With another 3 or so hours to pass, entertainment was provided by a Soccer AM DVD and, with remnants of Carlisle away all over again, the good old classic board game. Shout out to me, who won, of course! Arriving at Highbury Stadium at around 12.45, the fans headed to Jim’s Sports Bar, a large modern supporters bar, similar to Redz, where we were made most welcome by the friendly home support. The ground itself has undergone major regeneration over the past few years, in keeping with the Cod Army’s rapid rise up the football pyramid, and this was clear to see. The away support was housed at one end of a modern, single tiered grandstand on one side of the pitch, which you enter via electronic turnstiles! Above was a row of executive suites. This stand also housed the tunnel and dugouts. A majority of the home support were behind one goal, in a large terrace, whilst opposite was the smaller Percy Ronson terrace which is used for larger away supports. What was interesting about this stand is that it only runs three quarters of the width of the pitch with the remainder being what looked like a portable toilet block. On the other side of the ground was a small, single tiered stand, which also only ran for three quarters of the length of the pitch. This is because in the corner of the ground is an old clubhouse which didn’t look in use, which was dwarfed by a large electronic scoreboard. What surprised me about this stand was the fact that it had been built in front of their old grandstand. I’m led to believe the old stand is listed so cannot be knocked down. Certainly a first at any ground for me! …so it was disappointing result again, as the Reds dropped to the foot of League One, but it was an enjoyable day out at a welcoming club with a brilliant family atmosphere. The coach journey back, like Rochdale, was subdued, but with a short trip through Blackpool on the way back, the lights of Blackpool Tower lit up a few smiles on what was a hugely disappointing day. The coach arrived back at the Checkatrade.com stadium at around 11.30pm. It’s that time of the season where your support is needed more than ever. After another loss at Chesterfield on Tuesday, 27th we finally got that elusive win against Preston on Saturday 31st with a cracking winning goal from Lee Fowler, on his debut. This Saturday, 7th Feb., we go to Huish Park on the back of that win with renewed optimism. Please get behind the lads more than ever. Never stop believing. COME ON YOU REDS! !